5 Star High Octane High Performance Racing. This is Director Scott Waugh's, (Act of Valor) second venture into the feature film universe, but he is well qualified to make a film about fast cars and the inherent danger that lye's within. As he has 41 Stunts credits to his name, (We Were Soldiers, Bad Boys II, Mr and Mrs Smith). What he has created is a petrol heads dream, whether you are male or female as there is plenty of eye candy, from American muscle to European super cars. You're in for Speed, Smashes, Crashes and Ace Driving. After the death of his father Tobey Marshall, (Aaron Paul, The Last House on the Left) takes over the running of Marshall performance Motors. he and his friends do up American muscle cars such as GTO's and Mustangs. But there isn't enough work coming through the doors, so there is a visit from his dads old bank manager calling in the loan. He supplements his money by taking part in late night street races for a prize of $5000. 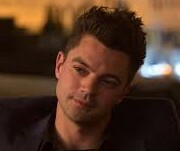 He may be too good as his old rival Dino Brewster, (Dominic Cooper, Captain America: The First Avenger) turns up to watch him race along with his old girlfriend Anita, (Dakota Johnson, 21 Jump Street) and he tells him he wants to see him after the race. Anita is Little Pete's sister and little Pete, (Harrison Gilbertson, Haunt) has been taken under Tobey's wing as a younger brother. Dino is the one from MT Kisco New York that made it all the way to NASCAR and even though he thinks Tobey is beneath him he admires his skills as a mechanic and offers him a job of finishing the car that disapeared the Ford Shelby Mustang that Carroll Shelby was working on when he died. The cash strapped Tobey has no option but to accept the 25% finished car price, estimated to be $500,000. He is ribbed by his friends, they think he is doing it to get back with Anita. The next race gives a particular stress to the full-length film. The end may be unpredictable for any of the participants in this operation.